Donna Serdula is working as System administrator at Universal Containers. She has received a requirement from higher management whenever an account is created for Industry Not For Profit, auto create a case and assign it to Nonprofit Experts queue to verify organization’s nonprofit status. Now you can refer the Queue id while creating a case through Process Builder. The problem with this approach (Hard-coding queue ID) is, If you are developing in the Sandbox, the IDs of the newly created Queue will change when you get to Production, and you have to do the rework. –> As per Salesforce best practice, everyone will suggest you don’t Hardcode IDs, Query for them. It is always good to follow Salesforce best practices where possible. At the moment Process Builder doesn’t allow to query and save the outcome (means record ID, field value, etc.) in a variable, even you can’t save newly created case ID (case created through Create a Record – process action) in a variable. So what next? 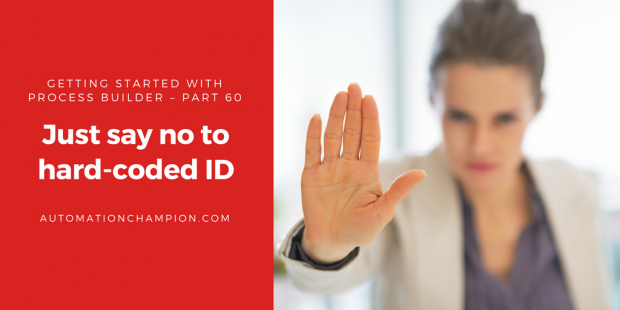 How to avoid Hard coding of IDs in Processes? Custom Label: – Custom labels are custom text values that can be accessed from Apex classes, Visualforce pages, Flows, Process Builder or Lightning components. While deploying a custom label, its data also gets deployed. To avoid the unexpected behavior make sure to update the custom label value post deployment. Custom Setting: – Custom Settings are variables that you use in your code but set and modify outside of your code. Custom settings are cached. It is especially useful to store information that will be often accessed from Apex code or Flow as it will perform better than a custom object. It does not count against SOQL limits when fetched. You can use hierarchy custom settings in Process Builder directly, not list custom settings. The custom setting doesn’t bring data over when you deploy them. Custom Metadata Type: – Custom Metadata Types are similar to Custom Settings. While deploying a custom metadata type, its data also gets deployed. Currently, custom metadata types are not supported in Process Builder. You may want to vote on this idea Use Custom Metadata Types in Process Builder, Formulas/Validation Rules. To create an invocable process, select It’s invoked by another process for The process starts when. For current business scenario, we have selected A record changes, as shown in the preceding screenshot. As always, thank you very much for this useful information! As I can understand it, since IDs might change in different environments, it’s a best practice to use Custom Labels, Custom Settings or Custom Metadata Types. But, when using a Custom Label, for example, we DO add the ID (of a Queue, Record Type, etc.). So when I’ll create/deploy it in the Production Environment I might need to update it. So what is the advantage of using the Custom Label? Thank you so much for your feedback Gidi. If you don’t do this, then you have to deactivate your process, clone it, then update it with correct id. Thank you Rakesh for your response. Really awesome stuff. Yes, I too hate it when hard coded ids appear in apex or workflows.